This weekend I wrote about my wonderful studio. I’ve been feeling particularly appreciative of it in these last few weeks, since I haven’t been able to use it. In February, a week shy of our one year anniversary in the place, we had to move out of our condo while some emergency repair work was done. The upside is that we are getting new floors. The downside is that we had to move everything out of our place for over a month, and live out of a rental. 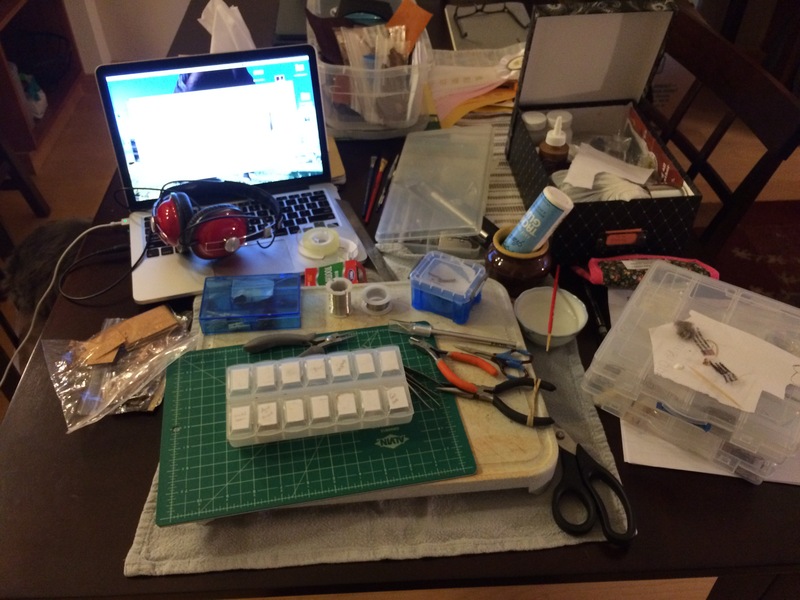 As you might imagine, productivity on hobby goals has dropped considerably. Either way, it’s not optimal. I have a lot of things I want to get done. In particular I’m trying to finish a saddle set for the NW Expo show in a few weeks… I’m gonna have to step up my game in order for that to happen! The good news is that we will hopefully be moving back into our home next week. I can’t wait to be back in my beloved studio and crafting away madly! 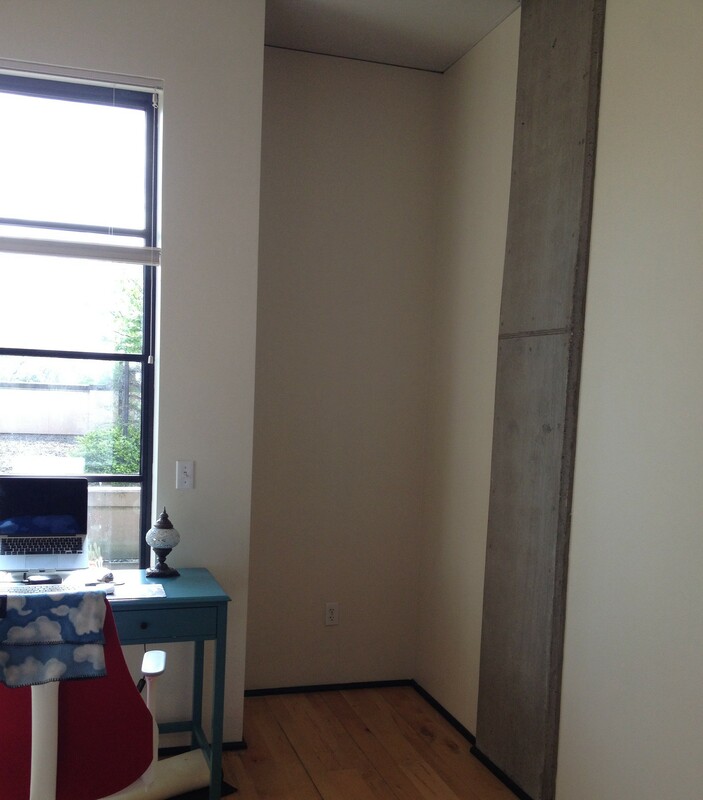 When we were looking for a home in 2013, I dreamed of finding one where I had room for a dedicated studio. 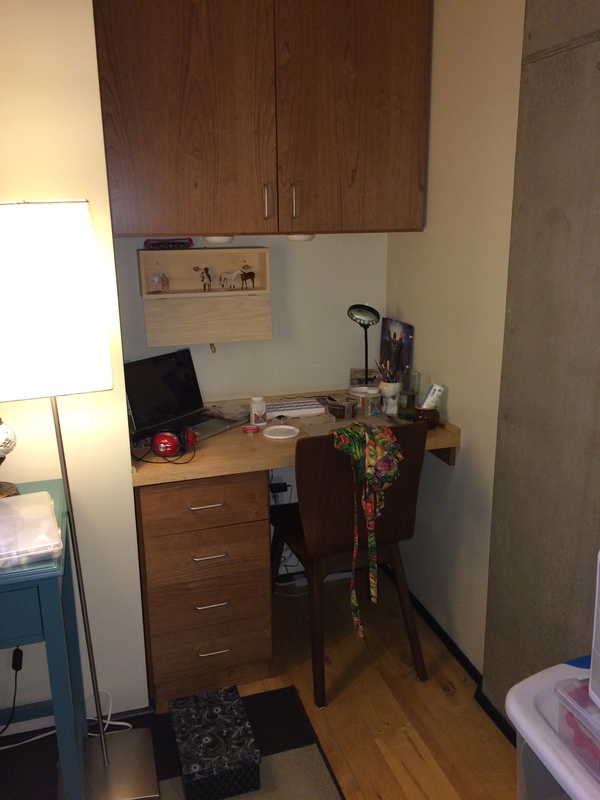 Not necessarily a whole room, but a space where I could organize and keep my supplies and always have a nice place to work. 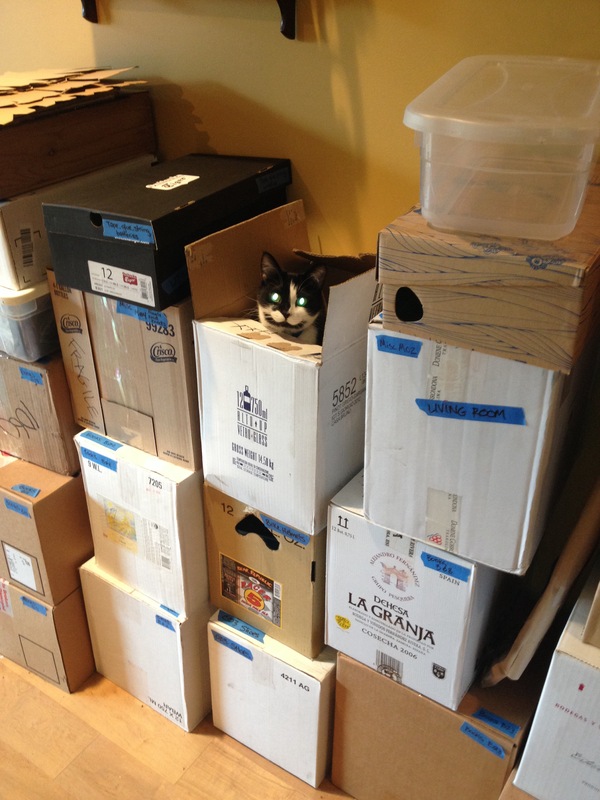 In early 2014, we moved into our beautiful new condo. 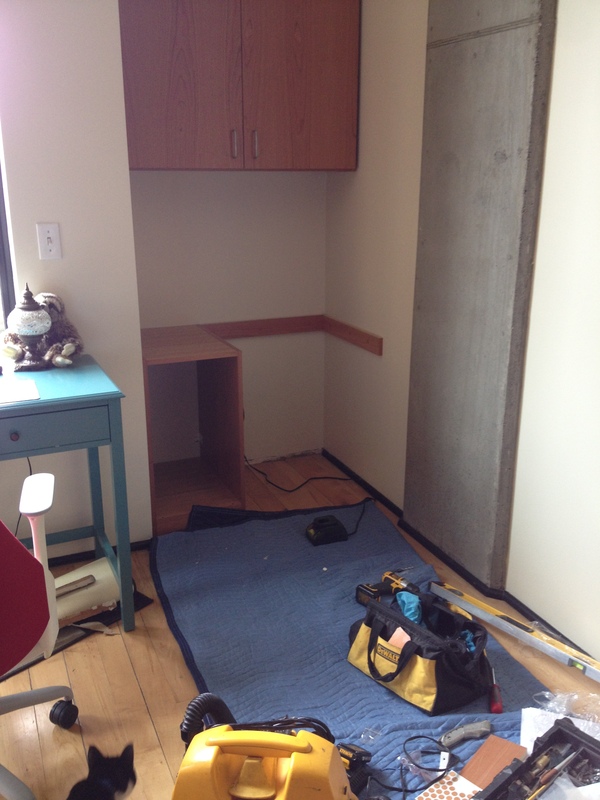 It’s a open loft style space, and in the corner was this strange little alcove. We don’t know what it was supposed to be, or how previous occupants might have used it. 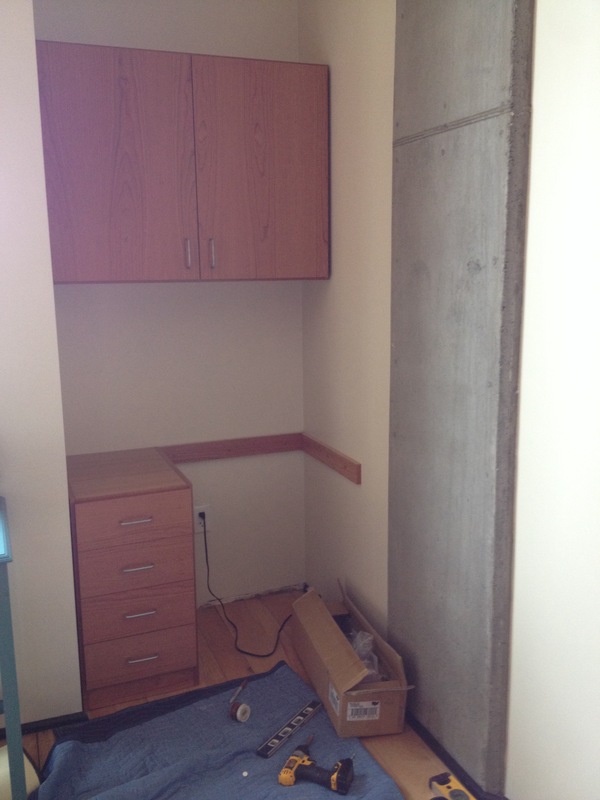 But we knew what is was for- my future studio! 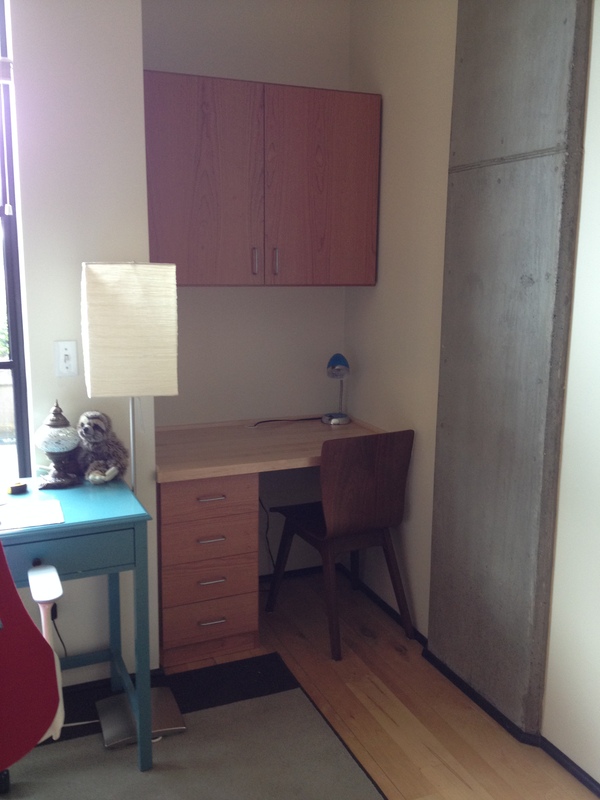 A few months after moving in, we worked with a local company to turn the alcove into a studio. 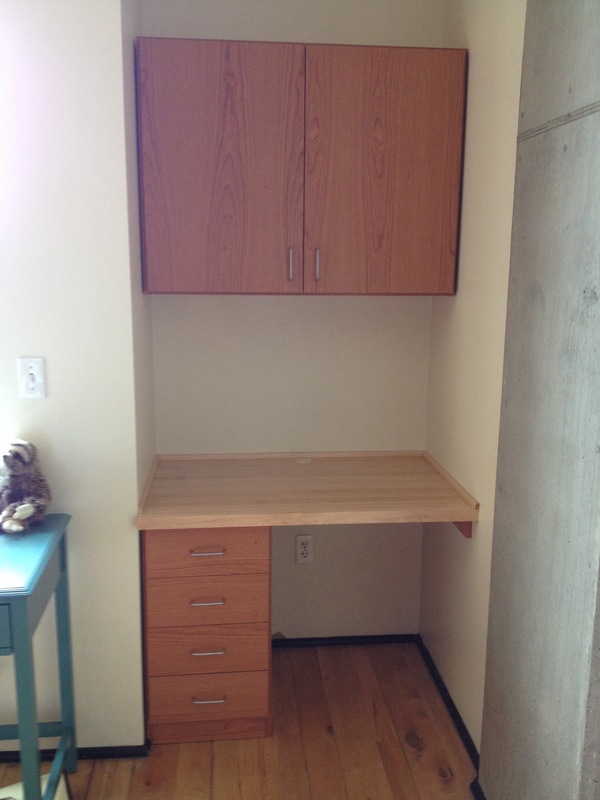 And added awesome, perfectly sized drawers. Last but not least was a lovely butcher block top. The whole installation took only part of a day, and then my beautiful studio was ready! I spent a wonderful weekend obsessively organizing all the drawers and cupboards. 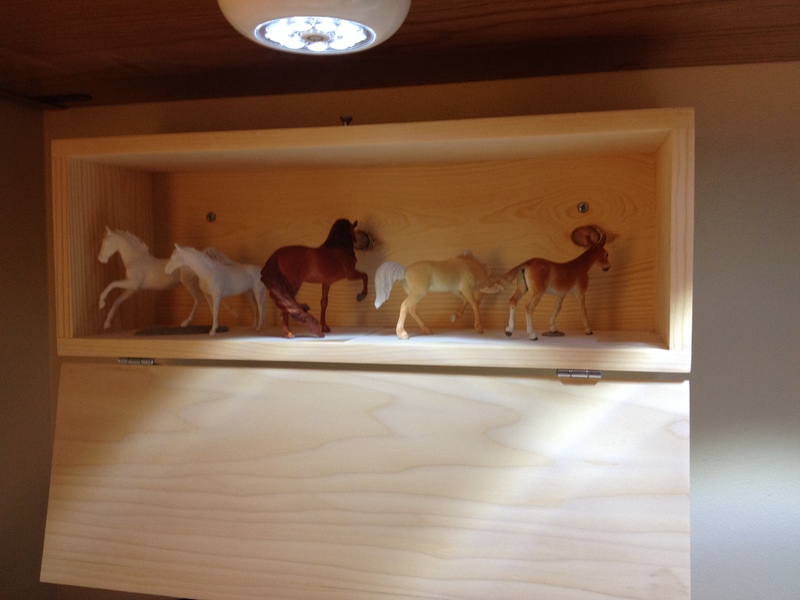 I also ordered a custom wood box from a lovely artisan on Etsy in which to store my horses in progress. That way they were safe from dust, kitties, and whatever else I was working on. Next I needed the perfect lighting. I looked at a million desk lamps in various styles and prices and finally found the perfect one at a stupendous price- a simple, LED gooseneck light from Amazon. It even has a built in magnifying glass for when you really need to work on something fiddly! I also bought some stick on LED tap lights to shine down from the bottom of the cupboard (visible in the picture above). Finally, the studio I had always wanted was realized! I love, love, love my little studio. It’s pretty, organized, and just the right size. I love being able to jump right into hobby fun without having to drag out all the supplies from storage and set up on a table. It’s wonderful to have this dream come true. I’ve been super busy this week trying to judge a breed division for IMEHA while also doing the final planning and errands for a 300 person tech conference I’m helping organize. Event planning is hard work! So I’m rather behind in both model stuff and blogging. But here’s a quick handy dandy tip. 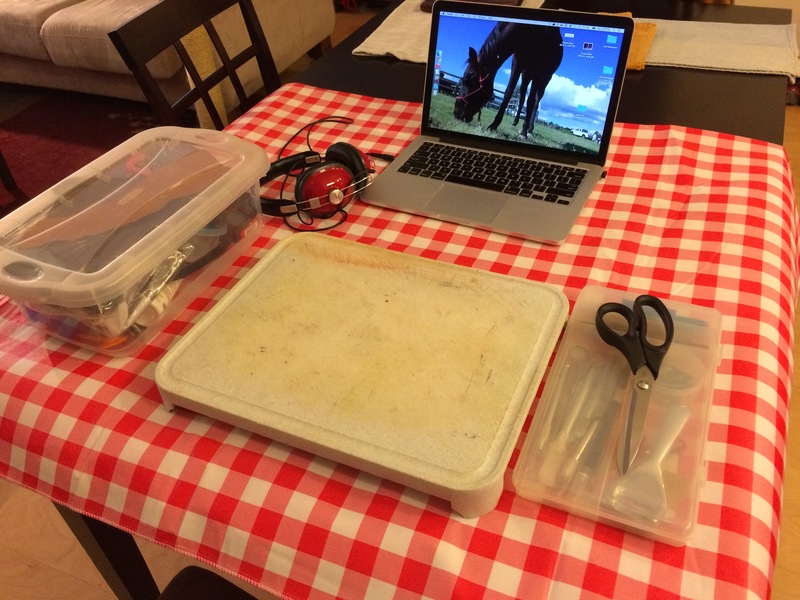 Whether you’re painting, sculpting, or working on tack, I find it’s very helpful to have a catch-all tray under where I’m working. I think mind might be part of a tupperware- I likely scavenged it from Goodwill or a freebox. 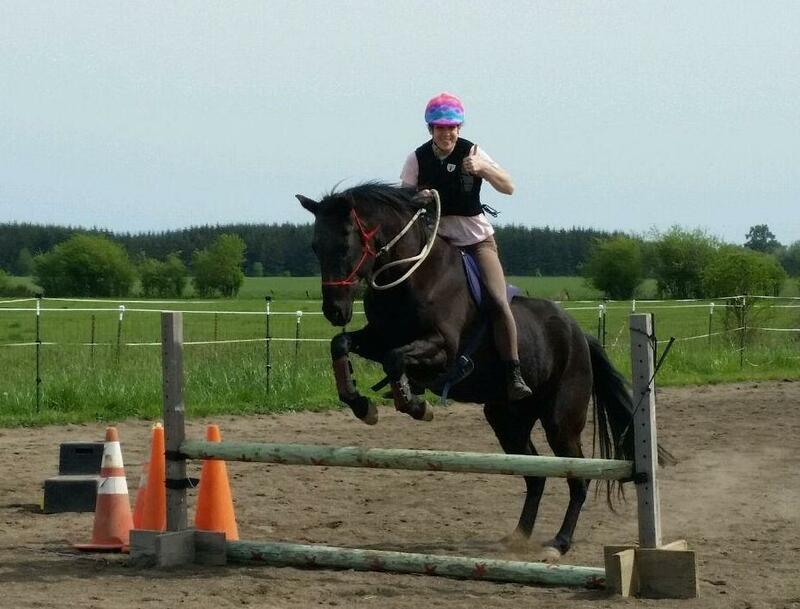 It’s nice to have not only to contain the mess, but also to catch flying bits (oh, I needed that buckle! ), mix paint on, and other random tasks. It helps me to keep my table clean, since it catches most of the pastel dust, leather scraps, and plastic bits that inevitably fly about. If you’d like something a little more posh than mine, you can buy a Tabletop Tarp with foldable edges to hold your hobby projects. Here’s two sneak peeks of current projects. I hope to have the pony finished in time for the September shows (she’s a commission) and the trotting cob will be a Christmas gift. The conference is tomorrow, and maybe Sunday or Monday I’ll resurface. 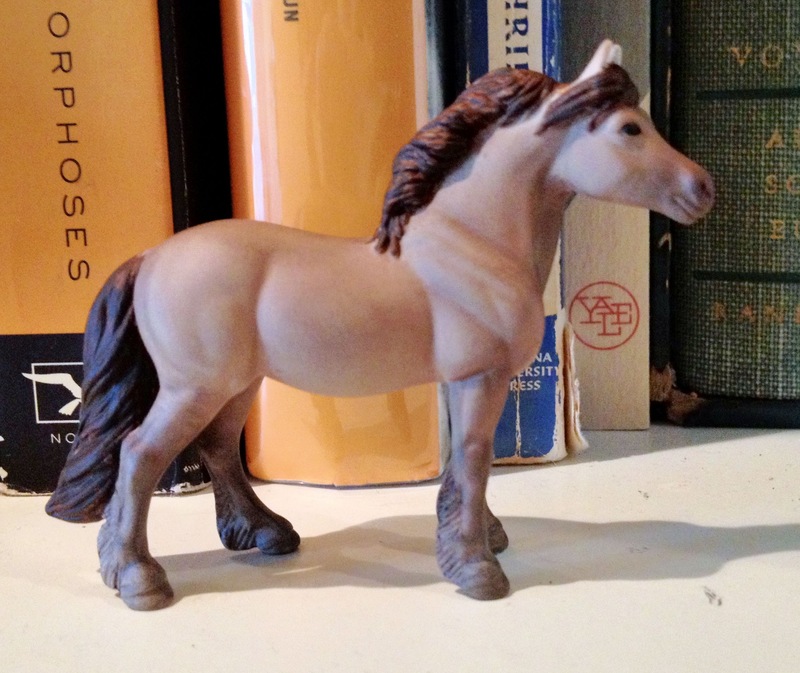 I have been working somewhat regularly on my ponies but have nothing terribly exciting to report- I’m plugging away on the Sculpting Herd, the Pastel Herd (who has a new member, the “Head Up Mare” aka Lilah) and my first ever commission (as trade for the PS Chips TB body that I’ve been torturing). While juggling all these projects, I’ve found it extremely handy to take some notes about where I am in the project, what it needs, what it has, and what I want to do next. 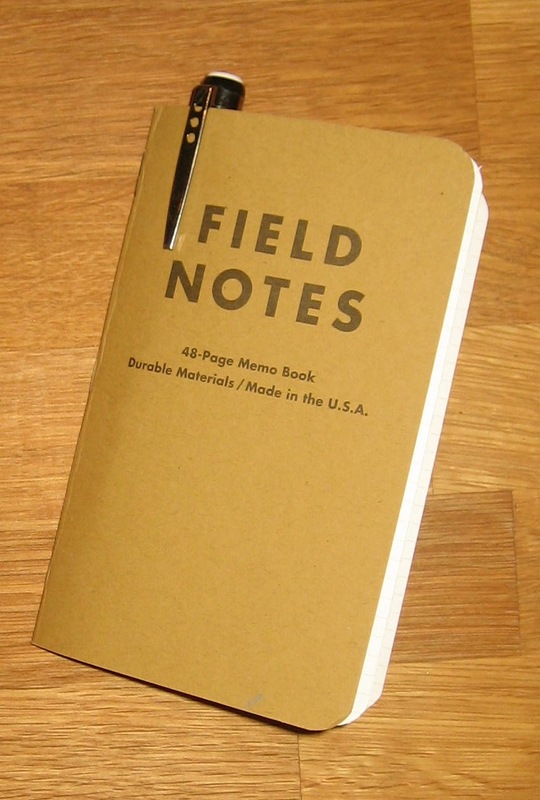 So I’ve got this handy-dandy notebook. 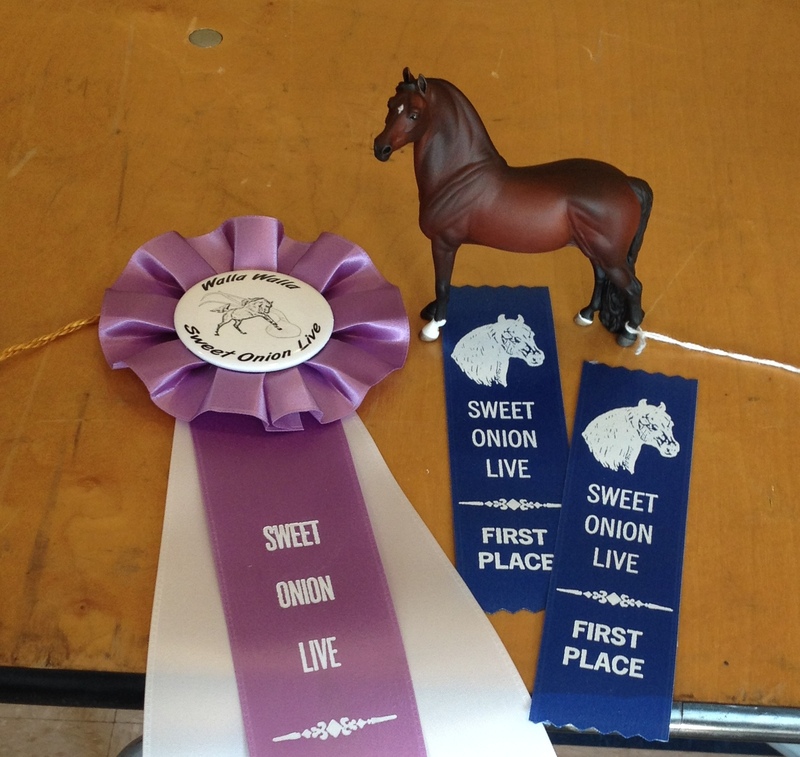 I make a section or page for each horse and that way I can keep track of things. That means less second guessing, less redundancy, and less frustration. It also makes for more accuracy, more efficiency, more focus, and more learning. 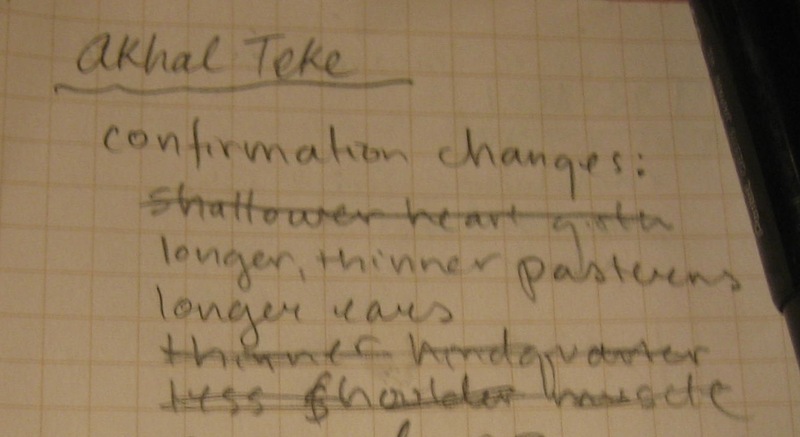 My Akhal-Teke drastic resculpt needs a lot of work, and one of the things I used my notebook for was to brainstorm and then record some of the changes I wanted to make. That way when I sit down to work on him I have a clear idea of where I’m headed. Plus, writing out some of the important breed characteristics I’m going for helps solidify the idea in my head and makes for an overall more accurate representation. 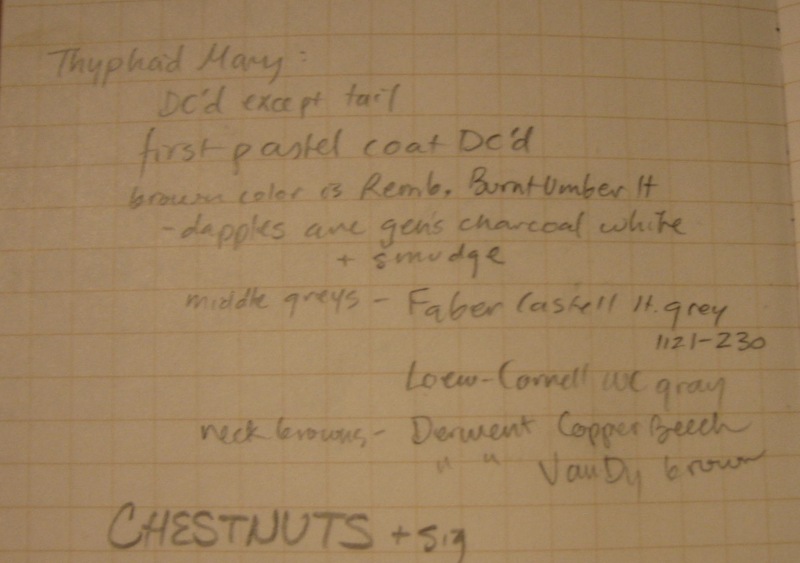 I started Typhoid Mary’s note page when she was ready to paint, since her dapple bay-going-grey is a rather complicated color (and the first going-grey I’ve done). In my notebook I can keep track of what parts are already Dull Coted, and thus ready for pastel application. This is good for when you go long stretches of time between work periods, as I sometimes do. And it’s even more important on a horse who, unlike Typhoid Mary, doesn’t have such a nice tail hand hold. On those I might not be able to Dull Cote the whole body at once, and this way I’m not confused when the pastels refuse to stick to his front legs. I’m also keeping careful track of the colors I’m using on Typhoid Mary. I’m doing a lot of her coat in colored pencil hair detail, and I want to keep track of how I’m doing it so that the sides match up. Plus, if I ever forget how I did it or what colors I used, I’ve got it all written down. I also use my book to keep track of who needs to be dremeled. I prefer to do my dremeling in batches, but before I started using a list I would often forget someone who needed work, and only remember after I’d put everything away again. When I keep a list, no one gets forgotten- and I only have to sweep the bathroom once. Several people have asked me what I use for sculpting. It got me thinking about my brand loyalties in general. There are some hobby supplies for which I do have a preferred brand or supplier, and others for which I’m much less picky. As I outlined in a previous post, I’m a fan of Testor’s Dull Cote, Aves Apoxy Sculpt, and Krylon Primer. On the other hand, there are some items that I use regularly which I am much more flexible about, particularly when cost or availability vary. I understand why other people are more selective. But as a cheapskate amateur, I can afford to be a more adaptable. 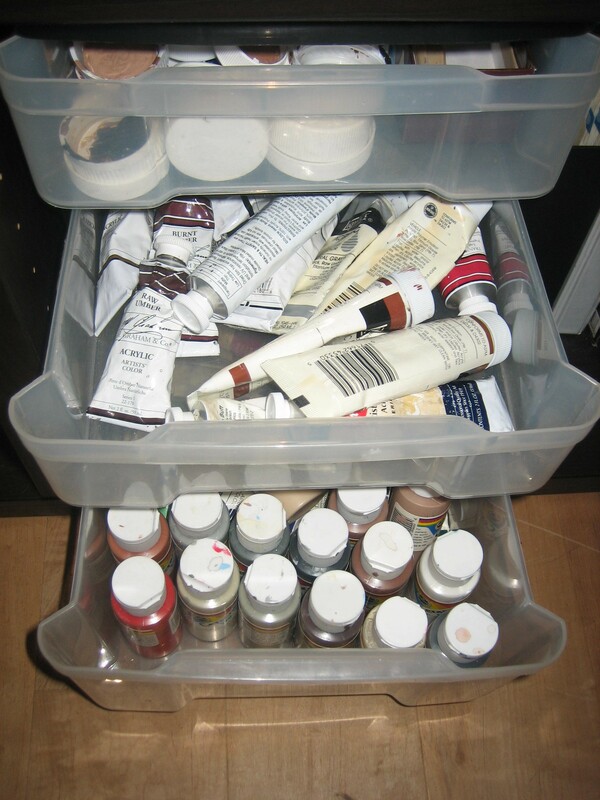 Acrylic Paints – For starters, I’m a terrible acrylic painter. 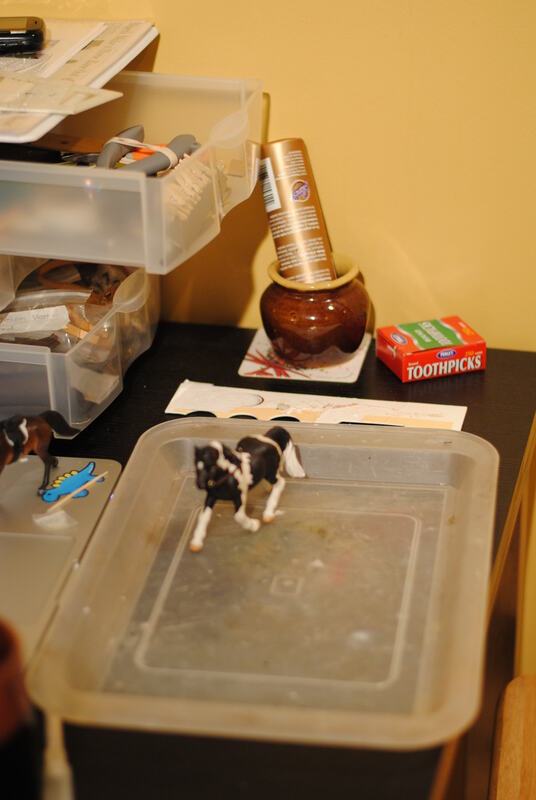 I use them almost exclusively for details where pastels won’t work, or for painting props and dioramas. Therefore I am really not picky about my brands or the nuances between them. My paints have been acquired from a variety of sources from my college’s book store and various art stores to garage sales or my mother’s studio. So when I reach for a color, it might be Liquitex, Grumbacher, M. Graham & Co., Golden, or Ceramcoat, depending on when and how I acquired it. Pastels – Many hobbyists swear by one brand or another, and if I had unlimited income it’d be nice to try them all. Instead, I use the set of chalk pastels I owned before I ventured into customizing (Rembrandt), supplementing with a basic, inexpensive, and hobbyist recommended set of earth tones (Alphacolor). But when I run out of a color or happen to find a cheap source, I’m willing to try what I find most easily, provided it comes in a color and price range that works for me. 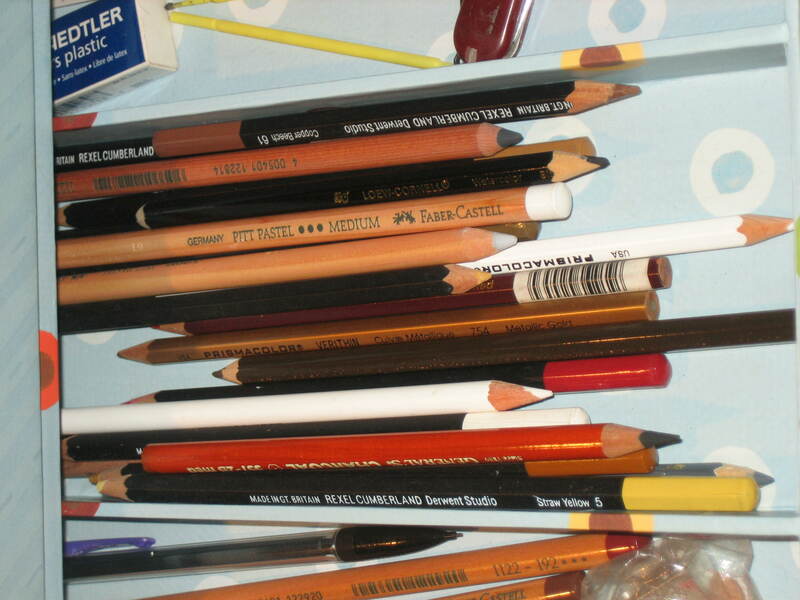 Colored Pencils – I started using colored pencils after reading about it online. I wanted to try it, so I just grabbed what I had on hand- a nice, full set of Derwent pencils and some Loew-Cornell watercolor pencils. I liked the results and when I ventured out for more colors ended up buying Faber Castell Pastel Pencils and Prismacolor Verithin colored pencils. I like all of these, and they seem to have varying effectiveness depending on what is it that I’m trying to do with them. Even when I’m using them, I just keep trying one after the other til I hit the one that works. And so when I see them at the store it’s a bit like candy, and I just pick up a few more here and then- resulting in the hodge podge of brands in my pencil drawer. Dremel Tool – In this case I actually practiced backwards brand loyalty by avoiding the Dremel brand. What I actually own is a Chicago Rotary Tool. Dremel is the most well known brand, and also the most expensive. Handily, once you’ve bought the tool itself the attachments and bits are largely interchangeable, so you can find what you need at your local hardware store regardless of the exact manufacturer. 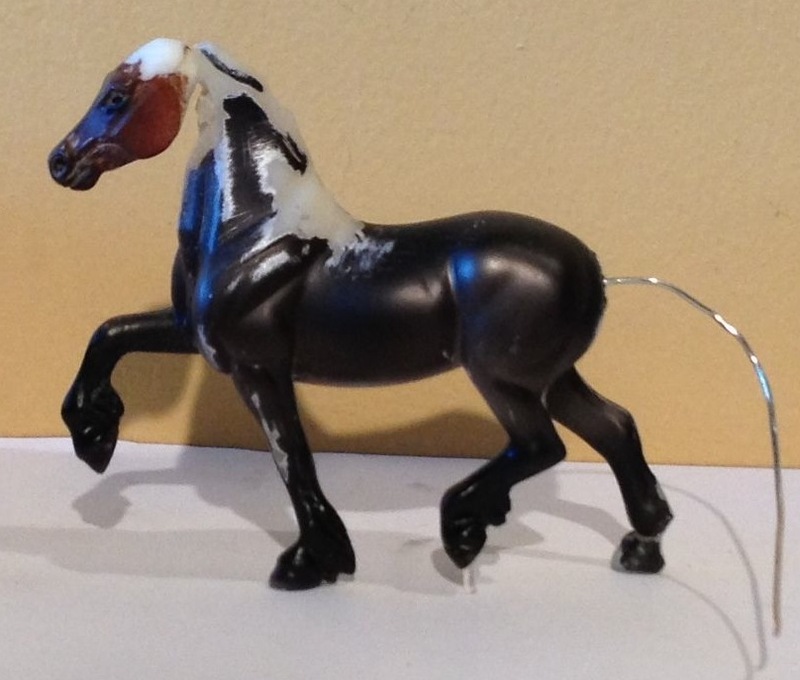 Today I was working on the coats of my three micro mini race horses and became frustrated with the organization of my pastels and the variety of browns available to me. So I hopped on my bike and set out to rectify the situation. 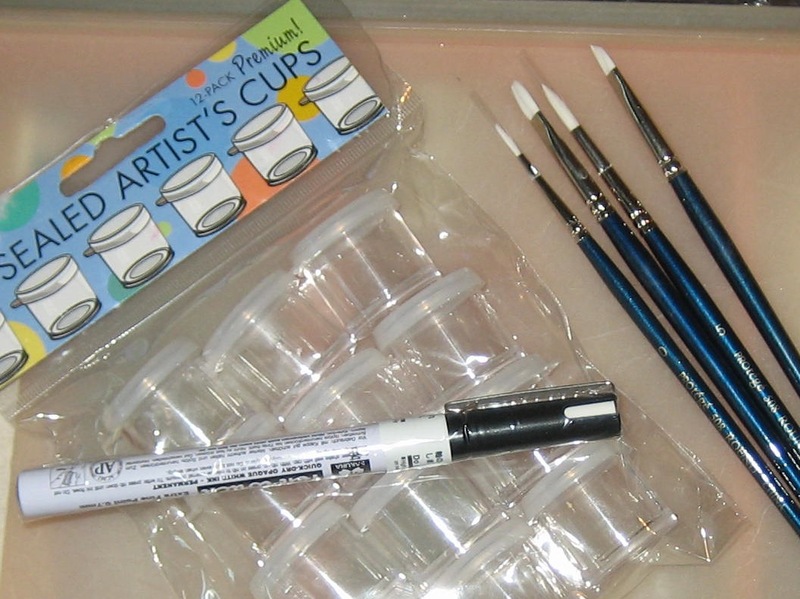 The artists cups are maybe a bit of a splurge, but I absolutely love how well they help me organize pastels. 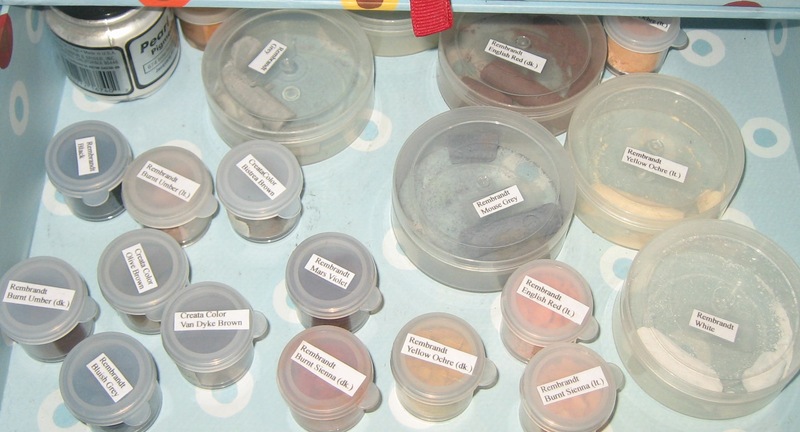 I can use to store dust from individual pastels and also mixes I’ve made for various purposes. The brushes were a necessity, since my favorite stiff pastelling brushes are getting so worn that their metal bits endanger the model with each swipe (eek!). The pen is a Pen-Touch Extra Fine in white, for signing horses when the black Micron won’t show up. It’s not essential, but it will sure makes things easier. I also picked up some new pastel colors from CreataColor. I chose Olive Brown, Van Dyke Brown, and “Bister” Brown. Hopefully that will help me with my various bays and chestnuts. When I got home I transferred all of my horse colors from my full rainbow set of Rembrants and into individual labeled artist cups. But masking tape labels were not enough! I had to print them out and modge podge them on. And now I can concentrate on the current projects without the distraction of mess.